Sheer nerve of publicity angle. 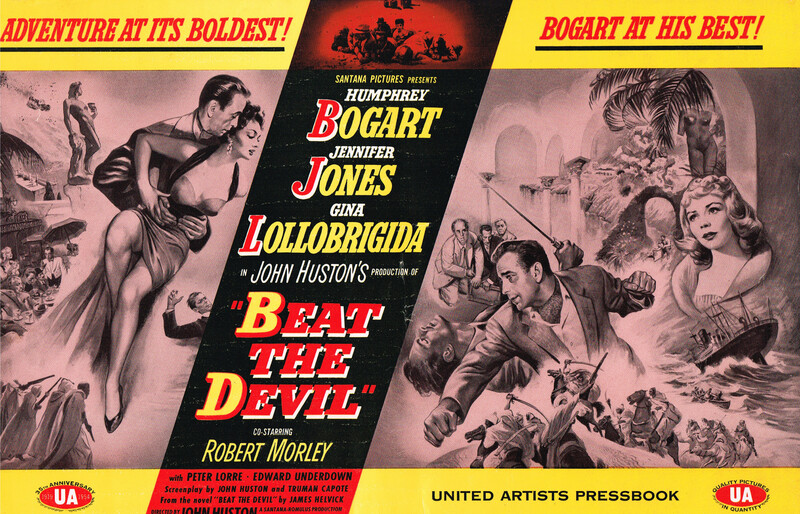 BEAT THE DEVIL could have been called Beats Me, to better describe whatever the hell went into the champagne-fueled ideas that John Huston and Truman Capote wrote up—frequently on the spot before shooting— in this 1954 flop, also directed by Huston (in his most non-directed manner). “Only the phonies think it’s funny. It’s a mess”. That was star Humphrey Bogart’s commentary on this in-joke backfire, and his legendary BS-detector wasn’t far wrong, since it’s somehow managed to achieve a belated modicum of cult status. Jen and Gina enjoy the location and paycheck. Meant as a send-up of complex spy thrillers, but the result is a troupe of mostly fine actors getting to go on location-vacation in Italy, floundering to try and make Capote’s puckish dialogue charming. Much of the writing is clever, but most of the line readings are terrible, with the veteran cast either rushing or flattening things–many scenes come off like a read-through rehearsal. 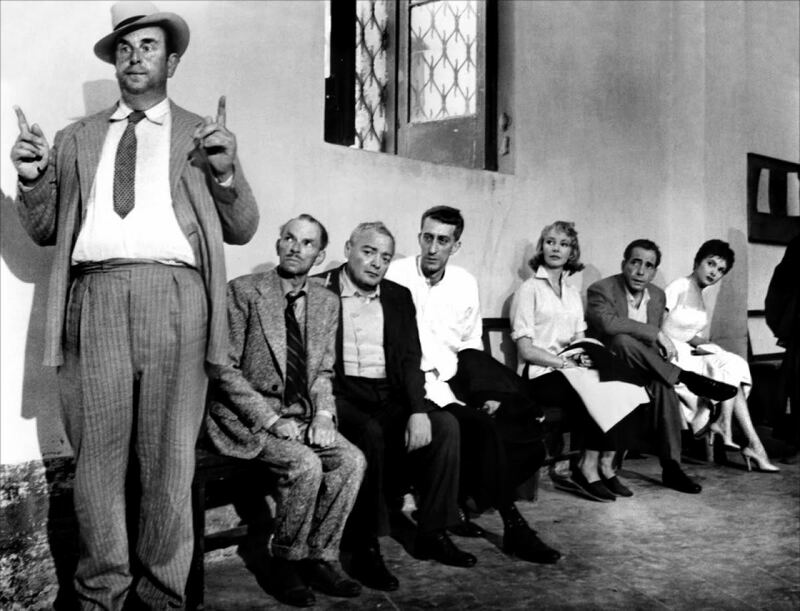 It contains the laziest performance Bogart ever gave. Jennifer Jones overplays and doesn’t handle her English accent on top of it. Gina Lollobrigida’s first feature outing speaking English is emphasis- troubled. Edward Underdown is just awful (he was Ian Fleming’s original choice for James Bond, which would have resulted in a series of One). Huston had other things on his mind (romance, gambling) and the blunted editing chops the scripts aimless airiness into chunks. Credit for persona goes to Robert Morley (he wrote his own dialogue) and Ivor Barnard, who occasionally transcend the blithering. Empathy goes to Bogart, whose mind seems to be on the money he invested in the production: lost lira, since the 89-minute thud justifiably H-bombed at the ticket booth. Costing $1,000,000 to film on scenic locations around the Amalfi Coast and Campania (missing another bet by not employing color), it slunk in at spot #102 of the years releases. With Peter Lorre (dyed blond and looking like he doesn’t give a fig), Marco Tulli and Bernard Lee. Making one solid dent of impression is Manuel Serano, who plays the Arab inquisitor—and he was not given a screen credit. Morley illustrating how results are at variance with whimsy.